Getting Started with Genos: Part 6: More useful suggestions to help you make the best use of the Registration Memory feature. The Music Chef: The Music Chef turns to the ‘Ensemble’ voice section for his recipe this month when he creates a nostalgic dance band Sax Ensemble. Tyros/PSR Workshop: Sometimes it’s nice just to play the piano. Saving a full keyboard Concert Grand piano on your keyboard. Penny Pieces: Arranger, composer and keyboard artist Penny Weedon has arranged the ‘Dance of the Clowns’ from Mendelssohn’s Midsummer Night’s Dream. Download Penny Weedon’s own performance of the Dance of the Clowns from Midsummer Night’s Dream as published in her October/November workshop. Guide To Reading Music – Part 23: Top teacher Gill Eccles continues her guide to the workings of the orchestra – with useful information about each instrument’s natural playing range to help us faithfully recreate it on the keyboard. CVP – Up Close & Personal – Part 29: With the Clavinova specifically in mind, Yamaha artist Richard Bower introduces some of the apps that have appeared online recently for the Yamaha keyboard player. Tyros/PSR Workshop: A step-by-step guide to making, and saving, a simple MIDI/Song recording. 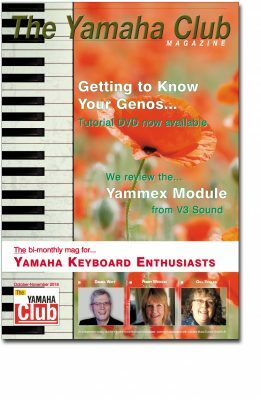 DVD Review: We review the first in a series of tutorial DVDs for the Genos arranger keyboard – produced and presented by Daniel Watt of Yamaha UK’s technical support team. Yammex V3 Sound Module: We review a MIDI expander module from ‘V3 Sound’ that is designed to be compatible with the Genos, Tyros and PSR-S keyboards plus CVP501/701 and CGP1000. Listen to some of the sounds that were mentioned in the review in the audio clips below. The Right and Left voices are solely from the Yammex module – the accompaniment style comes from the Genos/Tyros keyboard. All the sounds/effects are controlled from the keyboard and there are no second keyboard or bass pedals attached.